Deities from literature and history have long had a place in fantasy campaigns. Egyptian, Greek, Norse and Mesopotamian pantheons all contribute to the lore, superstitions and cosmology that make fantasy roleplaying so popular. For the first time in print, these pantheons are presented for the d20 System in a completely Open Game Content format for the 3.5 revised edition rules. Learn about the gods themselves, their avatars, the divine artifacts they possess, and their interactions with other deities. 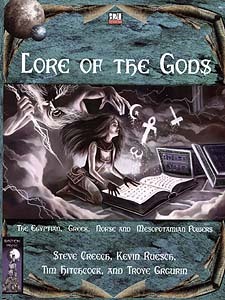 Lore of the Gods breaks down into gaming terms that will enhance your campaign and provide new elements to incorporate into your world. Familiar deities, monsters and heroes grace the interior of this tome. In addition, new artifacts, prestige classes, domains, spells, templates, skills, feats and forbidden lore await discovery. The power of Zeus, the wisdom of Odin, the knowledge of Thoth, and the evil malice of Lilith all reside inside these pages. Do you dare unlock the secrets of the gods? This product requires the use of the Dungeons & Dragons Player's Handbook revised.